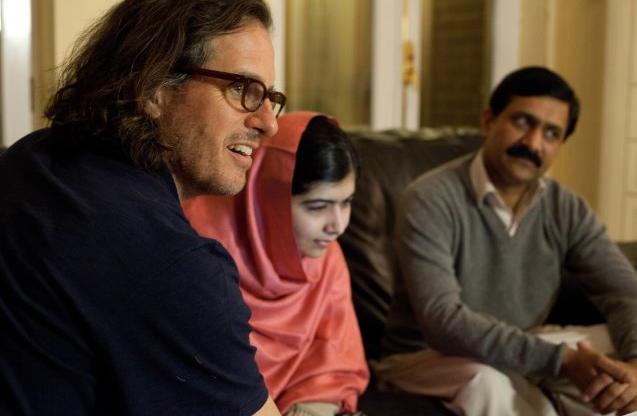 Academy Award winning filmmaker Davis Guggenheim sat down to discuss his newest film, He Named Me Malala. The film centers on the important story of Malala Yousafzai,, the Nobel Peace Prize Laureate who was targeted by the Taliban and severely wounded by a gunshot when returning home on her school bus in Pakistan’s Swat Valley. The then 15-year-old was singled out, along with her father, for advocating for girls’ education, and the attack on her sparked an outcry from supporters around the world. She miraculously survived and is now a leading campaigner for girls’ education globally. Question: What brought you to the story of Malala? DAVIS GUGGENHEIM: These producers Walter Parkes and Laurie MacDonald, were hunting down the life rights. The book was sort of pre-published and they had read some early chapters. They had acquired the life rights of Malala and her father and they were so blown away after meeting her in person that on the plane ride back to L.A. they were like, this can’t be a feature, it should be a documentary. And so they called me. Then when they asked me I was like give me a few days and so I read, I was just reading more about her. I only knew a little bit. Like most people I knew that she was shot on her school bus. If that was it, it may not have been enough but I became very interested in this idea of this father/daughter relationship. I have two daughters and it made me wonder, what was the chemistry between these two people? What was it that made them so interesting? So that pulled me in. Q: How did Malala and her family respond to having the cameras on them? DAVIS GUGGENHEIM: They were very into it. (Originally) They were unknown people in the Swat Valley, where the whole thing happened. It was a beautiful place, a very peaceful place until the Taliban came in. They felt at that time to tell their story was a necessity, to bring help. In the movie she starts blogging for the BBC, she starts speaking out publicly. So for them telling their story is part of their mission…. Which is refreshing. Often you start to bring out a camera and people run away from you. You can’t pretend that if you bring in a camera crew that people that people are just going to totally ignore it and act normally all the time. That being said, they were very open and very comfortable. The trick is that if you’re there long enough, people end up acting the way they’re going to act. People tend to be tense and self-conscious for a bit then they become themselves. Q: Before you brought the cameras out you had lengthy interviews with the family. What was the experience like in those three hour conversations and if they differed with later interactions? DAVIS GUGGENHEIM: In a fundamental way. People change when you bring a camera in a room. But people want to communicate they want to connect. Doing these very simple one on one interviews, you and me just talking, with no one else around. It can be different when you’re talking and someone is holding a pole over your head. I just sat in Malala’s office, just me and her and talked for three hours. She came out saying, “I’ve given so many interviews but I’ve never told anyone this.” There’s a spirit of intimacy in those conversations and there’s a spirit of wandering. Meaning you’re not deciding where the conversation is going. It’s like doing an interview without any notes. I recommend it if you haven’t done it. To make a connection and follow where it goes. Sometimes that’s hard if you have a story to write. Sometimes you want to cover the five beats you need to cover. If you’re really listening to the answer, sometimes that answer leads you to the next place. Instead of skipping along the surface and covering five different things, it takes one thing and it goes deeper. Q: Were there any documentary films that you had in mind when you were going through the process as inspirational pieces? DAVIS GUGGENHEIM: There was a film, Waltz with Bashir, which was an animated Israeli film. VERY different, very different. But it was a documentary with a lot of animation. I studied it. They had built an animation company, so I was interested in how they did it. Weirdly, I’ve never told anyone this, I looked at the film Grizzly Man. I looked at a lot of movies. I studied how that movie goes back and forth between a lighter tone and heavier tone and how it intercuts that. This is like… I’ve never made a movie like this before, very difficult story structure. It doesn’t really hold up as a comparison to another movie. For good or bad. Q: There’s a moment in the film where we see a montage of talking heads talking about their hesitancy to have Malala thrust as this figurehead for all of the Middle East. What do you think the objections are in these communities to her being this Westernized figure? DAVIS GUGGENHEIM: Well there are a lot of people who love her and think she’s amazing. Then there are people… I don’t want to give too much voice to the negativity but in simple terms people think… her poorly informed critics think she’s a tool of the West. I think people in the region say, why doesn’t she just come home? If she loves her country so much why doesn’t she just come home? And it’s very clear in the movie that it’s not safe for her to go home yet. Q: Did you have any personal safety concerns since your subject was a target of the Taliban? DAVIS GUGGENHEIM: I think she’s safe. What’s beautiful about her is that she doesn’t live in fear. Her mission is really important to her. She worries and is scared for sixty-six million other girls who don’t have school. On her eighteenth birthday she asked if she could go back to the refugee camp that we were at. She connects very closely to those girls who are experiencing what she went through. Q: What about as a result of the film in general? Were you concerned that there would be any sort of response from members of the Taliban? DAVIS GUGGENHEIM: Not really. I suspect they won’t like the film, but I didn’t make it for them. Whenever I make a film I think of a very specific audience… I mean I want the film to be for everyone, but I really thought of a teenage girl in Japan or in New Jersey or in India, I thought what would this young girl think of? How would they watch this movie? Q: What was your hope for a Western audience to take away from this? Aside from just education. 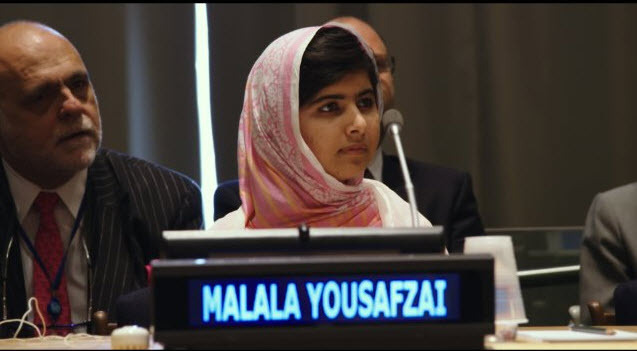 What do you think a teenage girl from New Jersey has to learn from Malala? DAVIS GUGGENHEIM: I have two daughters that go to a safe school, but I think there are a lot of things that keep them from feeling confident and speaking out. I think there’s a lot to learn from Malala because she was an ordinary girl who was brave enough to speak out for what she believed. And I know from myself that there are many things that bother me and disturb me and I say nothing. So I think that there’s a lesson in this for everyone. If she can do it, if she can risk her life to do it, I can do it. I can speak. How important that is and how that simple value is forgotten. That simple act. Malala and her father talk about how it was their duty to speak out. I think a lot of us shirk that duty. Q: A lot of documentary filmmakers say that they’ll usually go into a project having one film in mind and by the time they’re done with it it’s a completely different film. DAVIS GUGGENHEIM: That’s a good question. Q: What was that process like for you with this film? DAVIS GUGGENHEIM: I think if you start with a film in mind and you make that film, it won’t be very good because the process of documentary is discovering your story as you go, especially if you’re shooting new material. Things are going to happen that you never imagined. 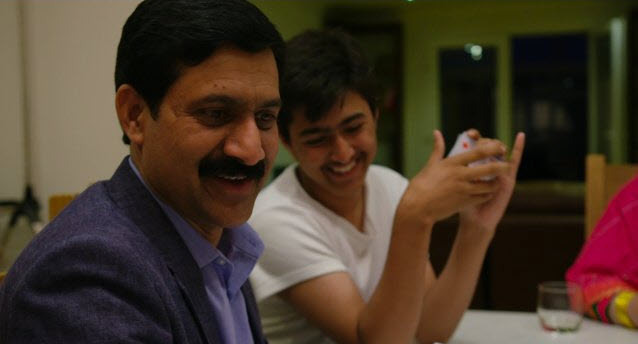 I never imagined the moment of Malala and her brother’s arm wrestling or her older brother saying he was the favorite child of the mother, things like that. Also the more fundamental deep questions that come up. When you make a movie you go on a journey and that’s a journey of discovery. My father who made great documentaries said, “Let the story reveal itself to you.” That was such a great lesson. If you’re open as you make it, you’ll find things you never imagined. Q: You mentioned you were inspired by Malala and her family and their relationships and how they interact. Was there anything that surprised you about the family and the way that they interact together? DAVIS GUGGENHEIM: I think it’s easy to think that she’s a superhero. Sometimes you see these extraordinary people and you think, I know I can’t throw a football like Tom Brady, I can’t sing like Beyoncé, I could never be Malala. She was born that way. I think that’s the surprising thing for me, she was an ordinary girl. Her life could have gone another way very easily. Part of it is the love of her father and her mother, but also it was her deciding to make a choice that made her extraordinary. That’s what’s so interesting, I think we all have that potential in us. Q: The film opens with an animated interlude about the story of the original Malala, who she is named after. Where did the idea of using the animated segments come from and what do you think it communicates? DAVIS GUGGENHEIM: Necessity is the mother of invention, right? I find, as you said, that you don’t know where the movie is going to go. Sometimes your biggest problems become the inspiration for interesting, creative ideas. Malala told me the story of Maiwand, which happened like a hundred years ago, or the story of her mother selling her books for candy, which she did in a place with no cameras. Those pieces are fundamental to the story. So how do I do that? Do I do reenactments with guys in helmets or an actor playing her mother, selling her books for candy? The thought of not putting those elements in the movie wasn’t a choice, in my opinion. Some documentaries get kind of hamstringed by those things and the filmmaker says, “I don’t have those things, I’m not going to put them in the movie.” I had done some animation in other movies, but smaller things. So I decided to build an animation company in my studio in Venice. I had a team of animator’s hand drawing these images. It was pretty fun… and hard. Really hard. The other part about it is the way Malala and her father were telling these stories, it had a kind of romantic longing. Almost a storybook feel. Sometimes that’s what I go for. Not just literally what they’re saying but what the feeling is. This battle could be told from the told from a half Jewish half Episcopalian guy from L.A. with long hair but I decided to animate it from the point of view of a young girl. If you’re saying, “I was named after this character.” What would that be like? So we kept redrawing and redrawing and I wanted it to feel like she’s imagining this girl climbing a mountain. It’s a storybook mountain. Q: Did Malala have any input into how the animation looked? DAVIS GUGGENHEIM: A little bit. Early on I showed them and said, “I’m going to do this.” And they were like, “What? I don’t understand.” But when I showed them they said, “Oh this is very beautiful.” They were great. They just sort of trusted me to tell their story and they loved it. Q: There’s obviously moments you capture in a documentary, moments, shots that you didn’t plan. Were there ever any moments where the cameras weren’t on that you kick yourself for something that you may have missed? DAVIS GUGGENHEIM: Always. We were there when she didn’t win the Nobel Peace Prize because everyone thought that she was going to win that year. Then we weren’t there when she did win the following year. She was at school and her teacher came in and told her in class that she’d won the Nobel Peace Prize. That would have been cool capture. No one thought that she was going to win then and we couldn’t be at the school anyway. That’s one of many. Q: One of the things Malala doesn’t talk about very much is her personal suffering. I was wondering about how you tried to talk to her about it. When asked directly she didn’t want to answer. DAVIS GUGGENHEIM: You see I kept asking her that question. She clearly didn’t want to go there. Q: Besides Malala’s suffering was there anything else that anyone else in the family was hesitant to discuss? world, being on camera is a bit immodest. Not from religion, but from tradition. In the beginning she didn’t really want to be a part of it, but towards the end she really wanted to be a part of it. Q: When you’re making a documentary have you ever gotten to a point when you start to worry that there isn’t enough “meat on the bone” for what you were hoping to capture? If so, how does your process change based on that? DAVIS GUGGENHEIM: Oh yeah. I’m always doubting, I’m always worrying. I still… I watched the movie two nights ago and I thought, “Why did I do that? Why didn’t I do this?” I’m never quite satisfied. Q: It’s a high wire act compared to narrative features. Q: With a narrative feature you have a script page, you shoot your coverage and you’re done. With a documentary, you’re just out there and you’re trying to make sure you capture enough of those special moments. Then you’re finding the film in the editing room. DAVIS GUGGENHEIM: Narrative people have it easy. They have a script. Good ones make the script better. At the very least it’s a map of where you’re going. In documentaries you don’t have that map, you don’t have a script. The first day you have your script is the last day of editing. It’s like, “Ok, that’s what it was.” Finding it is really hard. REALLY hard. Especially a movie like this that intercuts different times, it’s like a massive puzzle. It’s a puzzle that took a year and a half to solve. We were editing for a year and a half. Q: What questions are people asking and is there something that they’re not asking that you wanted to get across? DAVIS GUGGENHEIM: Sometimes the fundamental themes that are buried in the movie you feel but don’t necessarily acknowledge. And sometimes it should just stay that way. I think at the core of the movie it builds to this choice. I’m not the first person to say this but great characters are defined by the choices they make. When you’re forced to commit one way or the other. Am I in or am I out? To me the movie builds towards a choice of a girl… To speak out and risk her life and her father to let her do it and what are the things that led to that choice? To me, that’s really essential because you read about her as a girl who was shot on a school bus. That’s a victim story. But I don’t think (the film) is a victim story. I think this is about her making a choice, which inspires me. That’s what defines her. Her choice to speak out. Q: It’s right there in the title, HE named me Malala. You mentioned at the beginning that it was a father/daughter story. When did that emerge? At what point when speaking with the family did you realize that he was such a key player? DAVIS GUGGENHEIM: Right when I started reading about her. I thought, “Oh, this is interesting.” Maybe because I have two daughters. As a filmmaker the more I’m drawn in a certain direction… I could easily have made a geopolitical film that talks about Afghanistan and Pakistan and the history of that region. What are the forces that were there to create the Taliban and what’s America’s involvement? But I was really interested in this father/daughter story. The bigger mystery (to me) was this father/daughter… what were the ingredients to this relationship? Q: Was there anything that you found surprising about their dynamic that you hadn’t realized before you went into it? DAVIS GUGGENHEIM: Everything. You go in with an open mind, but you go in with questions. Is he a puppet master? Is she just a puppet? That’s certainly not the case, in my opinion. Did naming her influence how she acted? What is the nature of destiny? Did she choose this life? Something about the title provokes those questions. I want the title to provoke those questions. Q: What is your hope with the film coming out? DAVIS GUGGENHEIM: The dreamy version of it, and I love to dream, is it’s more than just a movie it’s a movement. There are sixty-six million girls who are out of school and Malala feels very deeply connected to them and wants to help them. She always talks about how each one of those girls have a story just like hers. The hope is that people see this film and connect to that and maybe speak out. Maybe the Malala fund raises the money to build some schools. Maybe it influences world leaders and changes policy. Q: What you think Malala’s future will look like after the film? DAVIS GUGGENHEIM: Can’t wait to find out. Sky’s the limit. She’s such an amazing person. She has all the potential in the world. DAVIS GUGGENHEIM: I’m going to take a sabbatical and be a dad. I’ve been on too many airplanes and not a present dad so I’m going to make dinner every night and bring my kids to school. Work less. I don’t have another project. Unemployed currently. He Named Me Malala opens nationwide today. It’s a remarkable and inspiring story that everyone should make the effort to see.